Carrie’s photograph-filled posts gave you an excellent idea of the hands-on labor that goes into building Moda’s Quilt Market booth. Looks backbreaking, doesn’t it? But there’s another kind of work that goes into Market, and it’s the kind that requires lots of looking, listening, and note taking. While I didn’t burn nearly the calories that those who were setting up the booth did, I noticed that while my muscles may not have hurt, my brain did. That’s because there is just so much to see and do. I carried my pink Moleskine notebook everywhere, jotting notes about patterns that appealed, notions that struck my fancy, and of course, the fabric lines I loved. I also tried to sniff out trends. While it’s not brand-new, one that’s continuing to make its mark is big-stitch quilting. It’s a little ironic that quilters have taken the hand stitching previously prized for its small, unobtrusive look and turned it on its head. Today’s hand-quilting calls attention to itself with threads in colors that contrast and lines that echo or cross over design elements. You can find it in both modern and traditional quilts. 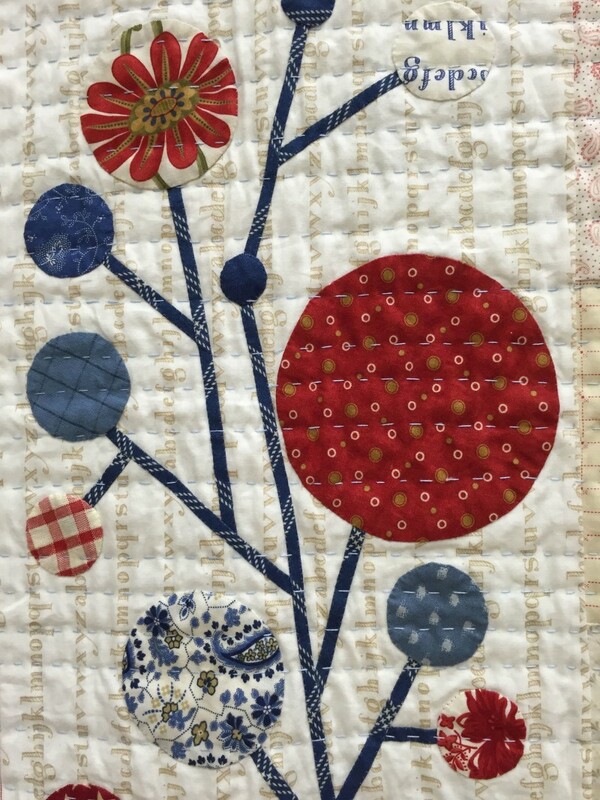 Laurie Simpson of Minick and Simpson used big-stitch quilting in Circle Garden, the pattern she created using their Polka Dots & Paisleys . Laurie uses 12-weight Aurifil thread and size 9 John James Darners or sizes 8, 9, and 10 Tulip Milliners needles. She only marked one of her lines—the first one—and then eyeballed the rest. The not-perfectly-even look reminds her of Indian kantha quilts, and she likes the handmade ambience it gives Circle Garden. 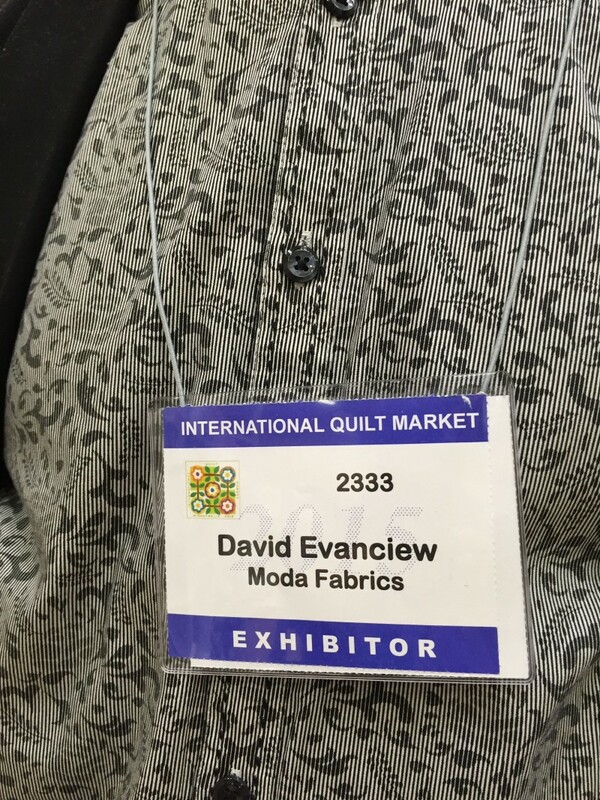 And then there was Moda fabric rep David Evanciew. Though he didn’t sew it himself, his shirt was evidence that the big-stitch trend extends beyond the world of quilting. Here’s David posing in Joanna Figueroa’s booth (where the black of his shirt and jacket works perfectly with the accents of black in her new Farmhouse line), and a close-up of the big stitches on the placket of his shirt. 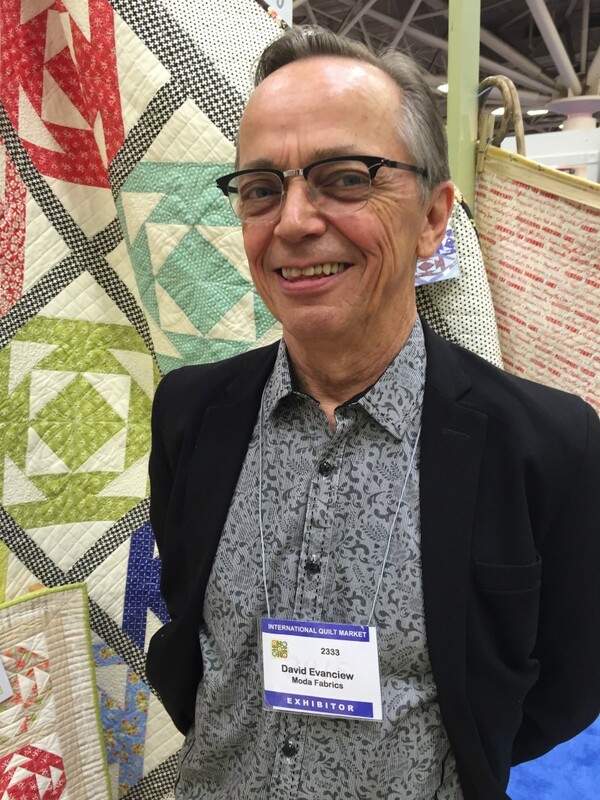 If you were at Quilt Market, did you pick up on any trends? Do tell! I find it funny to hear that the ‘big stitch’ is a trend. I have been using this style of quilting ever since I started quilting (my hands can’t do the tiny) and my Mom uses it too and she has been quilting for over 40 yrs. AND she can do those OMG tiny stitches, too – at 88. What goes around comes around! Sounds as though you learned to quilt from a master! 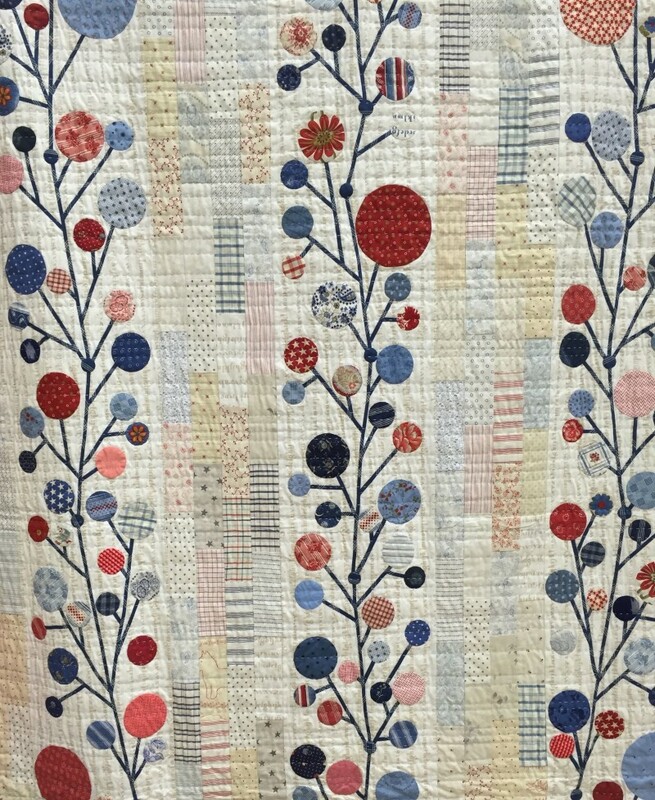 Our Quilt Guild recently had a “big stitch” hand quilting workshop by Dawn Heese, Linen Closet Designs, who gave an excellent demostration and coached us on our techniques. Love the look!! Plus, it was fun to stitch a table topper!! I found there were more wool pattern vendors. Pins and pattern giveaways were a big trend at Market. Great posting, thank you. You’re right about that, Mary. I was definitely tempted by all the beautiful colors and fun patterns. It seems to grow more popular every year. Where can I get the pattern for the quilt behind David in the photo? It’s called Sunshine. You can get it from United Notions and from Fig Tree Quilts. 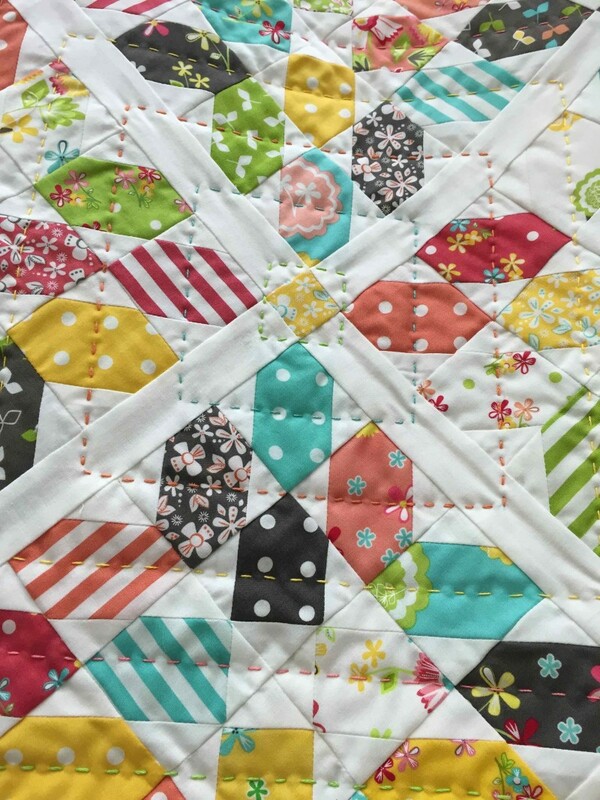 I recently finished a quilt using big stitch quilting with Aurifil 12wt…LOVE it! I’m getting ready to start another one…all free hand, no marking, and not in a frame or hoop. It works for me. 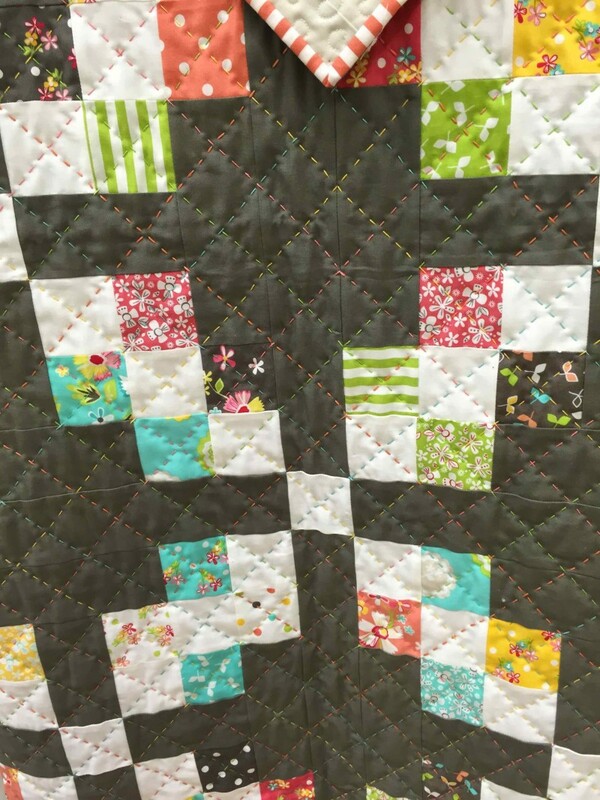 Wish I could have been at quilt market…but loved all your pix. It sounds beautiful! And fun and relaxing to make, too. Great to see Moda has such stylish reps! That’s just what I thought when I saw him! I noticed lots of “jagged” quilt patterns — similar to the Southwestern trend in fashion these days. Thx for your blog posts — really interesting! Yes—you are so right! I think these designs emulate the look of handwoven Navajo rugs. Great observation! Stylish rep indeed! Sadly did not make quilt market this spring but glad to see my Moda rep is styling the trend this year! Way to go David!